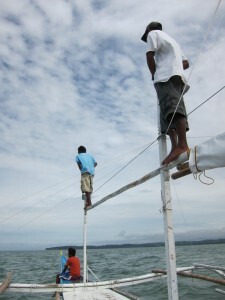 Perched up high, the boat spotters look for the whale sharks. 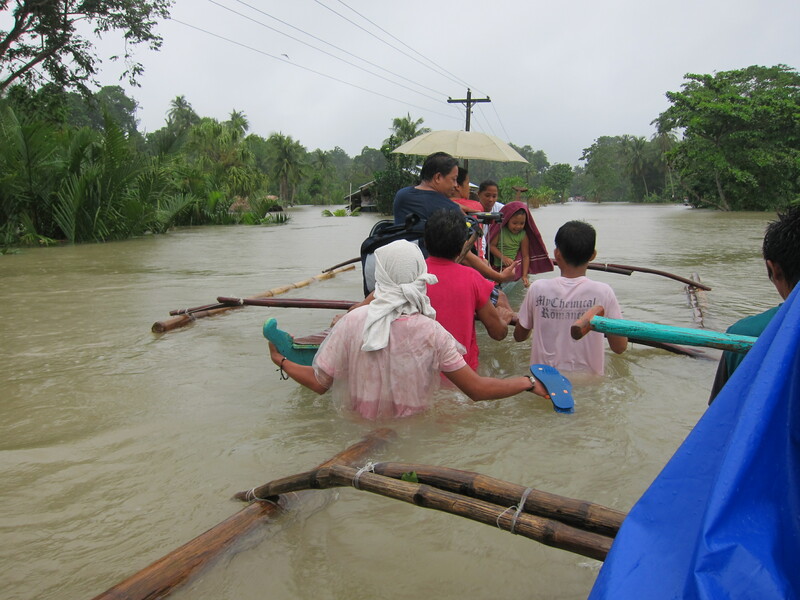 Yesterday we ventured on a plane, van, canoe, truck and tryke through typhoon-like conditions to get to Donsol. It’s whale shark season you see. And the short three month season when they come to this bay en masse to feed on plankton overlapped with our time here; we just couldn’t pass up swimming with the largest fish in the sea. But they may just pass up the opportunity to see us. We spent 3 hours on the water. The limit made by conservation authorities. And saw nil. Our boat crew watched from their perches and we sat with our fins on ready to jump at a moments notice. Nil. Nil. Nil. In fact, our guide said that in 6 years of taking people out, he’s never come back to shore with zero sightings. Hmph. We weren’t thrilled to be part of that stat at all. Luckily, we have the time to extend. So, we’re trying again tomorrow to see these gentle giants. Keep your fingers crossed. UPDATE: Sadly, no whale sharks were seen on the second day. Apparently it takes 4-5 days after a typhoon for the waters to clear enough that they’re easy to spot. Big big bummer. We did spend 3 hours on the green water seeing tons of dolphins and flying fish “running” from us. That was cool. It definitely wasn’t the circuit board patterned giant whale sharks that we wanted, but you can’t win them all. Go whale sharks. . Good luck seeing them. They seem very cool and my nephew likes them. Bummer. But glad the typhoon isn’t any worse for you. Where to next? I think God is trying to tell you that you and Josh have a future at FEMA. Oohhhh. That’s something new to think about! Nice pics, guys! It’s been years since I’ve been back to the Philippines. It’s good to see things are still as I remember it! Brings back lots of good memories. Thanks for sharing! Well chute! I wanted to see some pics.